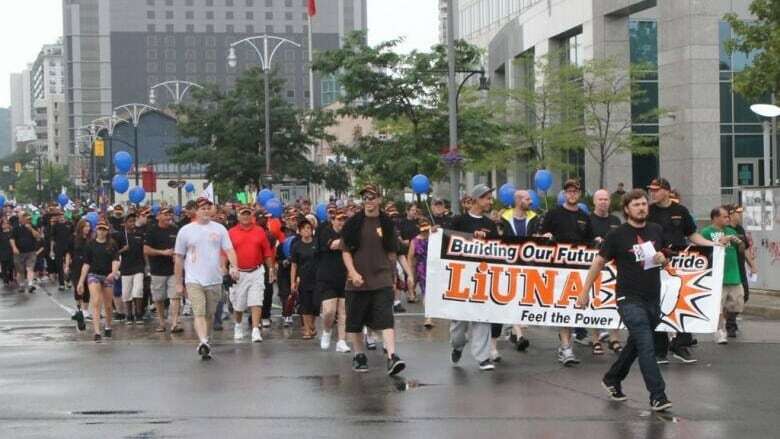 Locked-out workers from Hamilton's Max Aicher steel plant will once again take centre stage at the annual Labour Day parade on Monday. Max Aicher North American (MANA) plant locked out its workers about five years ago. Those workers will be in the first tier of marchers, right behind the Hamilton and District Labour Council (HDLC) — the group that runs the parade — and its invited guests. Striking and locked-out workers always march at the front, said HDLC president Anthony Marco. That means MANA workers — who have spent half a decade picketing at 855 Industrial Dr. — have become fixtures of the parade. "They've been up at the front for a while," Marco said. United Steelworkers Local 1005, which represents the MANA workers, has been trying to keep public attention on the issue. That includes asking the province for anti-replacement worker legislation. The matter dates back to November 2010, when MANA bought idled bar and bloom mills from U.S. Steel with promises of expansion, investment and jobs. About 50 retired members of United Steelworkers Local 1005 came back to work. The bargaining unit had 118 members. In 2011, the company began laying off workers, and continued to do so for two years. In 2014, MANA got a court injunction saying picketers could only halt replacement workers for 15 minutes. The remaining workers have been doing that ever since. As for the parade, this one marks 130 years of the HDLC, Marco said, adding that he's not sure how long Hamilton's Labour Day parade has been around, but it has a long history. Hamilton is known as a union town. And even though manufacturing is declining, and with it, the city's union density, "a lot of people respect the tradition of the working class and labourers as they walk around the city," Marco explained. The public is encouraged to come watch the marchers. The parade begins at 10:30 a.m. on Labour Day Monday. Unions and solidarity groups will line up on Stuart Street at 10:30 a.m. and head south on Bay Street to Main Street. The march will continue east on Main Street to James Street. Then it will head north on James Street to Strachan Street, and west on Strachan Street to Harbour Front Drive. It ends at Bayfront Park. At Bayfront Park, the council is holding a picnic with entertainment for union members. There are no advance tickets. Union executives can approach the HDLC and ask for tickets for their members, and the council will bill them for it. There will also be a water bottle refill station. The United Way will sell hamburgers and hot dogs, and beer will be sold in a licensed area. The Canadian Union of Public Employees (CUPE).